In the summer we wander around in shorts; talk to the visitors; groom the horses and generally besport ourselves in a professional manner made easier by the sun on our backs. Over winter the boys and girls are in overnight except the roughy toughy Shetlands who are allowed out (clue in their breed name) which means loads of shoveling the next morning. The day starts at 0800hrs when the Shires and the Donkeys are turned out and the Shetlands brought in.Then the mucking out begins. To make life easier we use the small tractor with a large trailer to transport the spoils of our shoveling to the enormous dung heap at the back of the cow shed. The heap is a bit like the magic borridge pot no matter how much you remove from the top it always seems to be the same height. I reckon someone tops it up when the farm is closed. 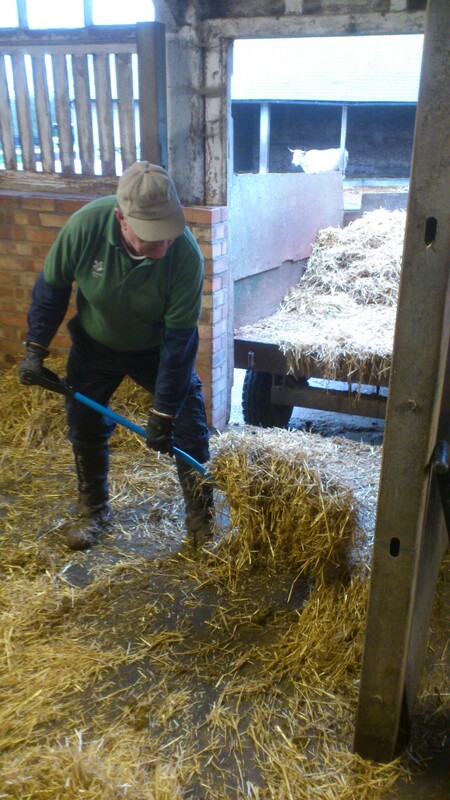 Mucking out is physically hard work, but great exercise and keeps you warm on a cold day. 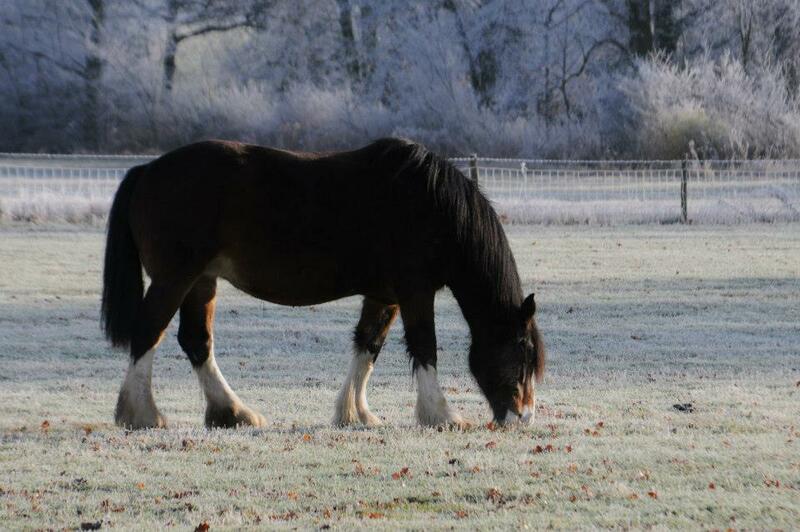 At this time of year the grass is not particularly wonderful so there is considerable effort in moving the horses either into different fields or into different parts of fields to ensure a reasonable food supply. When they come in at night they are all given a plentiful but measured amount of hay and some like Captain who is nearly 22yrs old receive a supplement. Its a balance between enough good nourishment and making sure they don’t get fat! 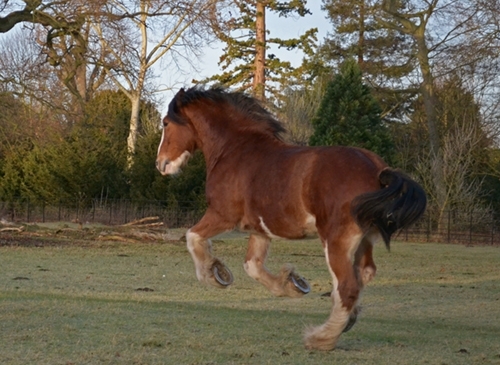 They don’t get as much exercise over the winter months. When we get them back in the first stage is hoof and feather cleaning. Sometimes they have a little play when its coming in time. Harry & Jasper were in long ropes Monday and as expected as far away from the gate as it was possible to be. So me and the boss (Emma) proceeded to take the long walk towards them. When we were about 10 foot away they both ran past us ( they were careful to give us a lot of space) to the gate where we started from. So we walked back up the field to the gate to collect them where they were patiently waiting for us. Of course they’re not clever enough to have done that on purpose! When we’ve got them in, at this point we were having to shade our eyes from the sun glinting of their halos; it was hoof and feather cleaning. 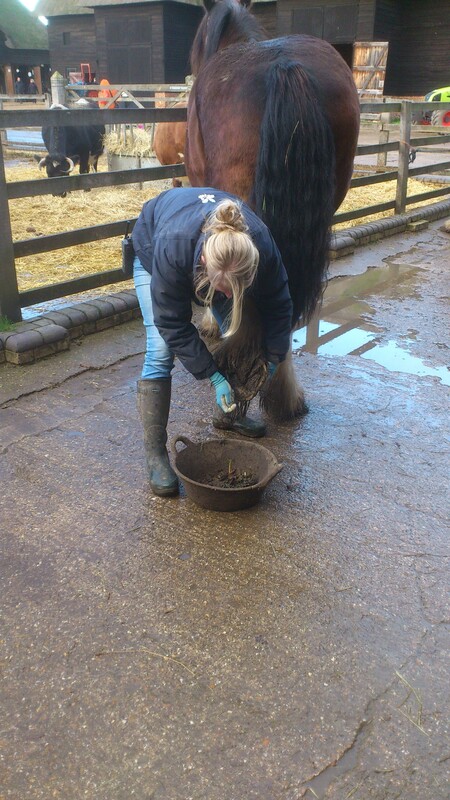 We remove mud and stones etc from the hoofs using a hoof pick. Couple of reasons for this one is to keep the hoof clean and reduce the risk of any kind of infection and the other is to make sure there are no stones that might cause impact damage to their soles. It is also a good opportunity to check that shoes are attached ok and in good nick.If the feathers are really muddy we also hose them off. Then its bed time. Our old stager Captain has a rug put on at this time of year to keep him warm overnight and the others are rugged as needed. Each horse has its own stable and there are always at least 2 next to each other for company. There’s lots of other stuff we do but that’s for another time. End of the day in winter is 1600hrs. We are all looking forward to Spring.